If Wednesday night's GOP debate lives up to expectations, it will be the highest-rated program in the history of CNN. And the ramifications for candidates and for television networks are far-reaching. Donald Trump -- and the rest of the Republican field's reactions to Trump -- has turned the primary process into a live-streamed, live-tweeted reality show. CNN has been calling Wednesday night "Round Two" in sporty promos. "Round one" was the Fox News debate in Ohio on August 6. That telecast had an average of 25.1 million viewers every minute, enough to make it the highest-rated non-sports program in cable history. The sequel will be held at the Ronald Reagan Presidential Library in Simi Valley, California, on Wednesday. Moderator Jake Tapper says his goal is to spur as much "actual debate" between candidates as possible. CNN producers are expected to make heavy use of the "two-shot," a split-screen technique, with cameras showing one candidate on one side and a rival on the other. Sam Feist, CNN's Washington bureau chief, said there are 13 cameras set up inside the library. Predictions about the ratings have varied. 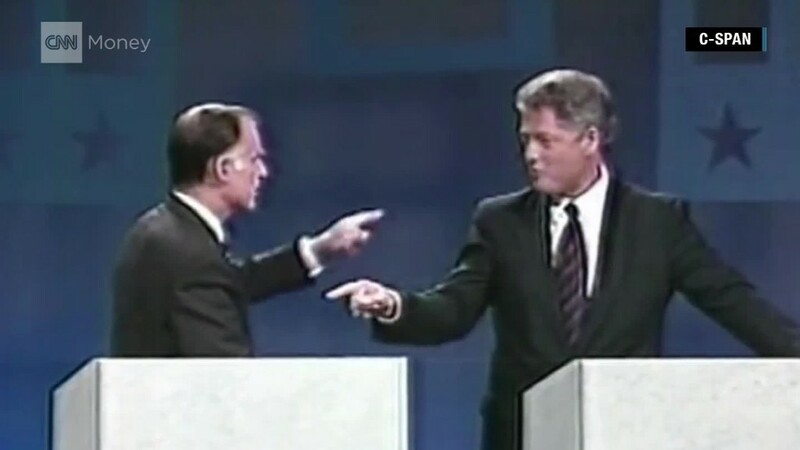 But the debate seems likely to surpass CNN's previous record, the November 9, 1993, edition of "Larry King Live," when Vice President Al Gore and businessman Ross Perot debated NAFTA. That sparring match averaged 16.8 million viewers. The first primary debates of the 2008 and 2012 campaign cycles attracted a few million viewers to Fox and CNN. As summer turned to fall, some of the debates drew 4 million to 5 million viewers. The events primarily appealed to political junkies. Trump has taken credit for the entire ratings spike. Analysts say he's the biggest factor, but not the only one. Case in point: Even Fox's 5 p.m. "happy hour" debate, with the lower-ranking candidates who didn't fit on the prime time stage on August 6, averaged 6 million viewers. For the candidates, this surge of viewership means extra exposure to the electorate, which could be a good thing or a bad thing depending on their own personal debate performance. And for the networks that are holding debates, the surge means extra revenue from advertising. CNN has declined to comment on ad pricing, but The Wall Street Journal estimated that the network is receiving "around $150,000 per 30-second commercial." CNN has given the debate saturation coverage ahead of time. A countdown clock started appearing on-screen last Wednesday. The ratings and ad revenue forecasts have been focused on the 8 p.m. debate, with 11 candidates on stage. But much like Fox's debate night, there will also be an undercard debate at 6 p.m. for four lower-ranking candidates. It's a big change from past campaign cycles. "We are producing two debates, not one," Feist said. "That adds a whole new level of preparation and complexity for Jake and the whole team." The producers will have less than an hour to transition from the first debate to the second. Feist said CNN built a three-story structure at the library so that the candidates and the audience will be eye-level with the Air Force One aircraft that Reagan used as president. It is a signature exhibit at the library. Tapper told me on CNN's "Reliable Sources" that he though the standout moment of the Fox debate was the split-screen between Chris Christie and Rand Paul as the two men tangled over government surveillance. Looking ahead to Wednesday, Tapper said he thought, "Let's have as many of those as possible." "What the team and I have been doing is trying to craft questions that, in most cases, pit candidates against the other -- specific candidates on the stage -- on issues where they disagree, whether it's policy, or politics, or leadership. Let's actually have them discuss and debate," he said. 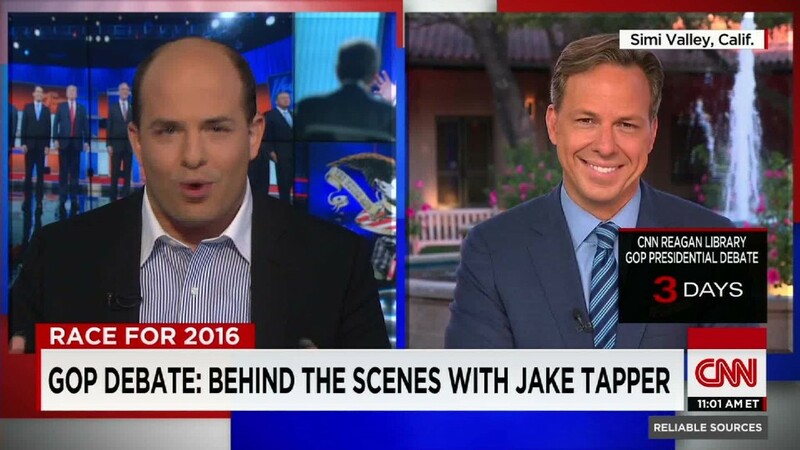 Tapper will be joined in the questioning by CNN chief political correspondent Dana Bash and radio talk show host Hugh Hewitt. Fox's moderators became a big part of the story last month when Trump challenged Megyn Kelly and Chris Wallace and accused them of unfair questioning. Trump also criticized Hewitt recently for asking "gotchas" on his radio show. But Hewitt said he doesn't expect much push-back from candidates or controversy about the questions on Wednesday night. "They all have plenty of other concerns than us or our questions," he said. Critics have taken CNN to task for playing up the "fight night" aspect of the event. There have been analogies to boxing matches and football games, and a boxing bell can be heard in some of the network's promos. But the "fight night" framing is nothing new. And on CNN's "The Situation Room," Bash suggested that Trump's rivals are the ones making it a match, because they feel they have to challenge the GOP frontrunner. During the first debate, "Donald Trump was on top, but he didn't have a solid grip on it," Bash said. "He has a solid grip on it now, and so there's no way that any of these candidates can ignore that, and ignore the differences between the policies. And that's what our goal is going to be -- to get them to talk about the policies and debate one another on them."